The Genius Retractable window screens are custom made to size and are available to fit every type and size window screen frame. When retractable window screens are not in use they are rolled up like a window shade, giving an unobstructed view and still allowing for ventilation when needed. Since this custom screen is concealed in a canister when not being used, it won't accumulate dust like standard screens do; this enhances the screen's appearance and prolongs the life of the screen. 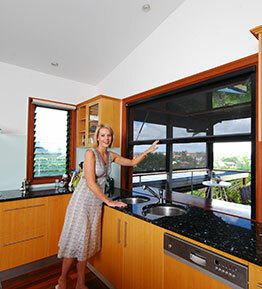 Additionally, our retractable window screens are easy to install. Order online today by selecting from category below on this page. Retractable window screens typically take 5 to 7 days to manufacture from the time of order.